They were exceedingly hospitable at Eskaton FountainWood Lodge. The facilities were very nice, very well maintained, and nicely furnished. The rooms were really nice. It was a little more than I could pay, but they're exceptionally well arranged. They gave me a very detailed description of the facility, and the things that they had available there. It was very thoroug,h and the staff was very nice, answered all my questions promptly, and made me feel very welcome. I felt my loved one would do well there. They demonstrated a caring attitude. I saw a few of their activities and explained some of the things that they do. The location of Eskaton FountainWood Lodge is nice and on a large piece of property with a lot of space around. The negative aspect would be that the place is older and the rooms are smaller than the other community I saw. The staff is friendly and gave me good information. They only had a small studio available, which costs more and was smaller. Eskaton FountainWood Lodge was very nice, clean, and large. The staff was friendly and informative. The rooms were adequate in size, lighting, and comfort, and the dining room was very large and open. We placed my mom based on their RN in house evaluation. After four days removed her. She was left alone to fall. ER doctor said don't send her back. In addition knew she needed a liquid diet, yet served her a roast beef sandwich. I do not recommend. Rochelle, We appreciate you sharing your experience. We strive to meet the needs of every single resident and their family. We take it very seriously when we read a review like this. Please contact Davina Barker at 916-988-2200 to discuss your situation. Fountainwood is tucked into a neighborhood of single homes, trees and lush landscape. There are plenty of places to walk, visit and mingle with residents or visitors. The dining area is attractive and home like, although not large in scale, there is ample room for residents to enjoy their dining experience. Memory care programs are in place and as part of the Eskaton family kept up to date and progressive for their residents. This Assisted Living and Memory Care community is indicative of Orangevale with city amenities in a country like setting. This beautiful community is a one story building for easy mobility with seven courtyards with fountains and lush landscaping. There is plenty of room to walk around rain or shine. Their care is exceptional with Smart Sensor Technology which provides caregivers with vital information about each residents habits so they can monitor changes in activity and respond accordingly. They offer two support groups that are open to the public for Parkinson's and Dementia. They have a gorgeous grand piano that is played regularly so you can sit and listen while enjoying a freshly baked cookie or rootbeer float. Pet Friendly up to 40 lbs. The best way to get to know a community is by scheduling a tour. See the facilities, meet the staff and residents, and get a feel first hand what it's like to live at Eskaton FountainWood Lodge Assisted Living. A friendly place to call home is what families will discover when visiting Eskaton FountainWood Lodge. At our light-filled and relaxing community, we provide the supportive assistance that our residents need to maintain independence along with specialized memory care services for residents with Alzheimer's and dementia. Eskaton FountainWood Lodge is one of several communities owned by Eskaton. We are a nonprofit based in northern California and have over 45 years of experience caring for seniors and their families. Every day, we find inspiration in becoming part of our residents' extended family. We offer a variety of spacious studio and one-bedroom apartments to choose from, and residents are welcome to bring their small pet (up to 40 lbs.) when moving in. Windows overlook the gorgeous landscaped grounds, and there is plenty of space to fill with personal furnishings. And housekeeping is a chore of the past since that's a responsibility our staff now handles! All utilities are included except for telephone. Brain teasers, strength training classes and tai chi - these are just a few of the activities that are held every day around Eskaton FountainWood Lodge. Our activity director fills the calendar with engaging outings and entertainment that have our residents exploring new sights and having fun with friends. 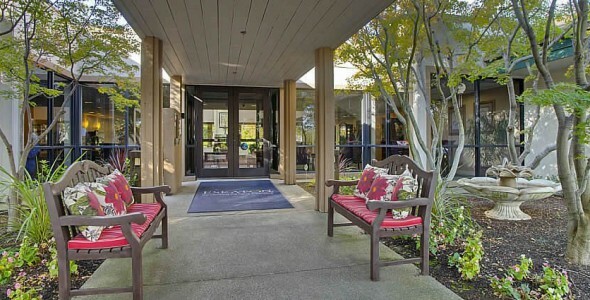 Residents are also often found gathering for chats or games out in the courtyard or bistro. Delicious meals are served daily in the community dining room that features restaurant-style dining. Snacks and beverages are available all day in the café. Other conveniences that make our residents' lives a bit easier include a full-service beauty salon and manicurist, and scheduled transportation for appointments. To provide the highest level of care possible for our residents, we have around-the-clock caregivers. Through our Medical Partners Program, a resident's physician can visit our community to conduct an on-site appointment rather than making the resident take a trip into town. Our community also has QuiteCare® (advanced motion-sensor technology) which ensures that our residents with Alzheimer's or dementia remain safe while moving about the community. At Eskaton FountainWood Lodge, we provide a serene setting that makes life enjoyable and relaxing for seniors seeking supportive services in Orangevale.